Briana Williams' performance on Saturday was low key in some ways, emblematic in others. The Oakland Park Northeast (FL) junior, who's coming off a sprint double for Jamaica at the IAAF World U20 Championships in Finland--where she became the youngest athlete to secure two golds in the events' history--had opened her outdoor season in February with a small meet, then followed with another this weekend in Hallandale. But facing better competition this time around--high school teammate Jan'Taijah Ford was in the 200m--Williams wasn't fazed in the rounds or in the finals and railed off a season best and US No. 1 wind-legal time of 23.29 (+1.0). Ford was just a hundredth of a second behind in 23.30. And yet, the win wasn't the key result to take away from that performance. "It's her fastest 200 opener (of her career)," Williams' coach, Olympian Ato Boldon said. What's more, it might take a mountain to beat Williams in 2019. 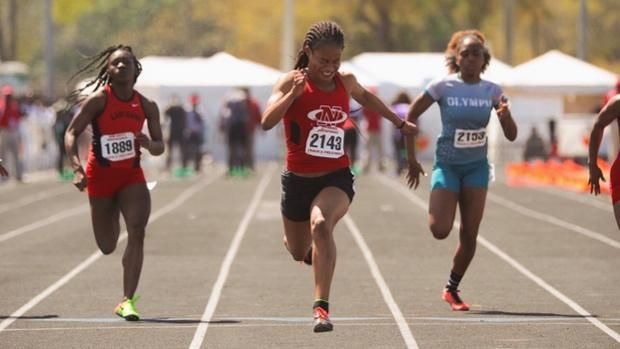 Two years ago, she was the strongest freshman sprinter in her class, running to performance bests of 11.30 and 23.56 as a 14- and 15-year-old. She raised the bar in 2018 with a 15-year-old world age best of 11.13 before capturing the the sprint double at World Juniors at the age of 16, which included a superior 200m performance of 22.50 seconds -- then her year concluded with a nomination for the Laureus World Sports Awards. But with her 17th birthday approaching at the end of the month, another year will signal something most around her already know: She's maturing, both emotionally and physically, as expected. And win or lose, Williams is on schedule. Better yet, though, she yearns for new obstacles. After her performance at Hallandale, Boldon called New Balance Nationals Indoor officials to enter Williams into the 60 meter championship this weekend in New York at The Armory. It's a different challenge, with seasoned athletes in peak form. Williams hasn't raced indoors since 2016. But she wants to give it a go. "The way Briana starts, the shorter the race the better for her," Boldon said. "She had to learn how to run the 200m. She's a born 60/100m runner."